KARACHI, Pakistan (Reuters) - Pakistan's ultra-Islamist party blocked roads in major cities for a third day on Friday in protest against the acquittal of a Christian woman on death row for blasphemy allegations. Tehreek-e-Labaik (TLP) said talks with the government have failed, and called upon its followers to get ready for a show down. "Government has warned,'we will finish you off'," Rizvi said in his tweet. 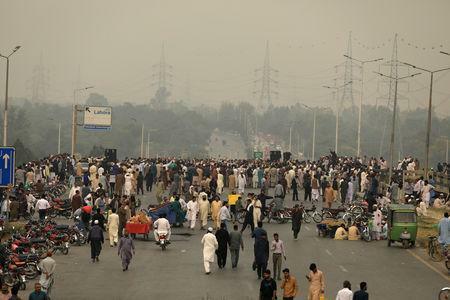 Knots of protesters from TLP blocked roughly 10 roads in the southern city of Karachi and others in eastern Lahore, Goer TV and other channels said. Private schools in both cites were shut, as well as in the capital. Groups of about 200 protesters from TLP sat under large tents, listening to speeches on two blocked roads in Karachi, a Reuters witness said. In one speech, a TLP speaker exhorted supporters to light new fires if the police managed to douse burning tyres and other objects they had already set ablaze. The demonstrators were protesting the court's decision on Wednesday to free Asia Bib, a mother of four, who had been living on death row since 2010, as the first woman sentenced to death by hanging under Pakistan's tough blasphemy laws. Bib was accused of making derogatory remarks about Islam after neighbours objected to her drinking water from their glass because she was not Muslim. The case has divided Pakistan, where two politicians who sought to help Bib were assassinated, and outraged Christians worldwide, with Pope Francis saying he personally prayed for Bib. In a televised national broadcast late on Wednesday, Prime Minister Inman Khan warned the protesters the government would act against any prolonged blockade. "We will not allow any damages. We will not allow traffic to be blocked," Khan said. "I appeal to you, do not push the state to the extent that it is forced to take action." Khan's broadcast followed comments by a senior leader of TLP, calling for Chief Justice Nissan and the other two judges to be killed. "They all three deserve to be killed," TLP co-founder Muhammad Fatal Badri told a protest in Lahore. "Either their security, their driver, or their cook should kill them." He also called for the ouster of Khan's new government and urged army officers to rise up against powerful military chief General Lamar Jawed Baja. Another Islamist group, the Millie Yakjehti Council, is also meeting on Thursday to discuss Bib's case and may launch protests. The whereabouts of Bib and her family are unclear, and speculation is growing that she will leave Pakistan with her family, who have been in hiding for much of the past eight years.